The Polish migrant community based in the United Kingdom amounts to over 1 million people now. This community represents the largest migrant movement in recent EU history. About 900,000 Polish nationals have settled in England, 100,000 in Scotland, 40,000 in Wales and 30,000 in Northern Ireland. Majority of Polish nationals who have moved to the UK since 2004 are young, educated people and aim to stay here for good. Economical aspect is the primary reason for migration, as better job prospects and career advancement opportunities are frequently mentioned. Below is a summary of a survey run on Emito.net in 2011. The survey was conducted among 1,180 Emito.net users. 40% of Polish nationals want to stay here permanently. That is a significant shift from 2006 when only 25% declared that they did not consider heading back home. 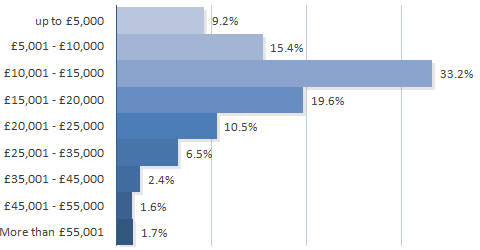 Majority of Emito.net users have been here between 3 to 5 years (40%). There are 22% of those who have been living here between 5 to 6 years and 10% who have been living in the United Kingdom for over 6 years. There are also over 8% people who just got here. 9% of Polish people are running their own businesses – that is 2% more than in 2006. However, the majority of Polish immigrants are employed in the blue collar sector (over 50%) – mainly in hospitality, factories, cleaning or customer services. There are 23% of those who work in an office environment and over 7% who are studying in the UK. Only 7% of people are unemployed which is 1% less than the British national average. Over 70% regard their English skills as either intermediate or fluent and 25% find their ability to communicate in the second language as basic. That constitutes 12% improvement since 2006. Many Polish people who came to the UK are educated to degree or college level (over 50%) and many have obtained an equivalent of A-Levels after passing the Matura Exam (over 40%). Polish nationals in the UK are mostly young people – 87% are between 20-39 years of age. Most of Polish nationals (77%) are either married or in a relationship. The majority of Polish nationals in the UK (over 57%) earn £15,000 or less per annum. There are 20% of those who earn between 15,000 and £20,000, 20% of those whose earnings are between £20,000 and £45,000. Only just over 3% of Polish immigrants earn more than £45,000 p/a. 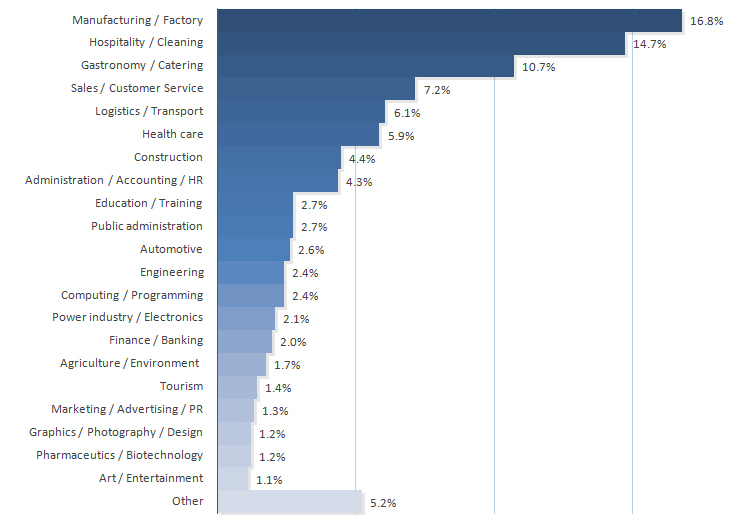 17% of Emito.net users work in the Manufacturing sector, 15% in Hospitality/Cleaning and 11% in Gastronomy/Catering.